Discussion in 'Transformers General Discussion' started by leomemorial, Aug 17, 2010. Agree with UltraMarcus. The decals look really out of place with a beige background. It just feels...cheap. 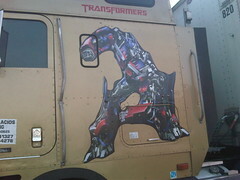 Black would work really well considering the Optimus Prime detail uses a black background. needs more red... a lot more red! Nah, no flames. I've seen a lot of cars and trucks painted with flames and it always screams, "I'm trying to make up for my lack of male fortitude!" I think I'll call him ConRoy. Maybe he didn't want to get too crazy and wind up getting sued for having a "Prime" truck ... but I agree the background doesn't do much for the images. Someone get this man a painting crew! I think it would look better as Motormaster. Right? If you're going to pay for that customization, why not do up the cab G1 style? 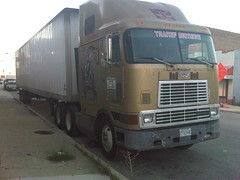 Years ago there was a guy who regularly drove I-70 though Ohio that had a red COE with an Autobot symbol on the door. Haven't seen the truck in a few years though.